Clare Croft (CC): Super Nature began as the two of you finished working with the dancers of the Lyon Opera Ballet, but still felt like questions lingered. 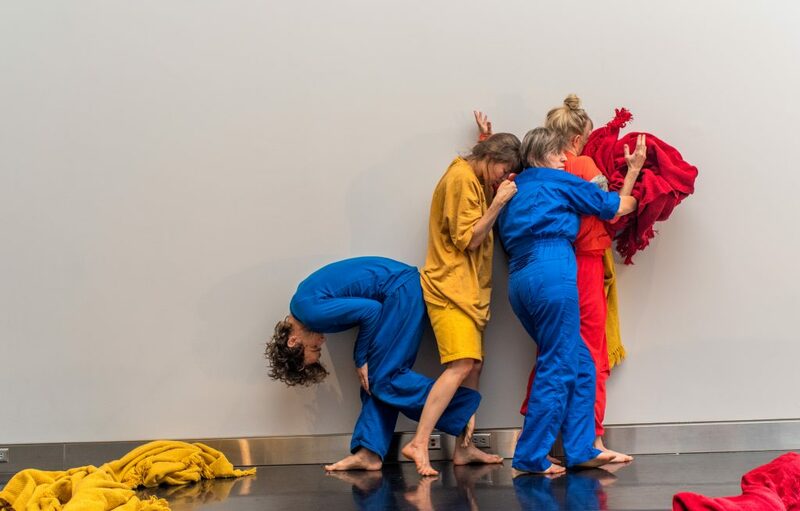 Could you tell me about those initial questions that first spurred the creation of Super Nature, which, in total, includes both the performance installation that we’ll see at TBA and a larger onstage group piece that has appeared in other venues? Olive Bieringa (OB): In Lyon we started to think about humans as animals. And then, [too, we were thinking] about dancers as really trained people who get looked at as “others,” [especially] in the way they get treated by the opera/ballet systems. And we were thinking about empathy. Otto Ramstad (OR): And how to think of them [the Lyon dancers] as people and not aliens. CC: How did these questions take form in the studio as you imagined them being embodied and being staged? OR: We got more and more into “What would it be like to choreograph empathy in the foreground? How would we actually do that?” And then [Super Nature] kind of became an ecological melodrama: a nature show about human animals. OB: “If we were to make a documentary about human animals, what would that be?” That was one of our impulses. OR: We were [also] talking about melodrama. There’s this really good interview with Guy Maddin on the Walker [Art Center] Channel. He’s talking a lot about the definition of melodrama. People think of melodrama as this really un-real, overactive, kind of wacky, overly theatrical thing, but he’s saying that the experiences that people have inside of themselves—to accurately express them would be like melodrama. He said he thinks his movies are more realistic because they’re actually acting out the feeling of what it’s like to be a person and to be in different situations. When we think about melodrama in that way with dance, it’s sort of like this piece was expressing how you feel, but expressing that kinesthetically—really expressing the kinesthetic value of your body. OB: [We were thinking about] the causal effect of our actions. Every physical action that we have on the planet with each other has an effect, and I think we wanted to create a hyper-experience of that for our audiences. CC: How do these questions of affective connection, particularly kinesthetic connections, get heightened or transformed when brought to the intimate scale of the installation? OR: We made this installation as a way to experience the empathetic condition [and to experience] the audience in a super, super intense and super direct way. OB: It was a training for our performers. Then it was also a training for our audiences. Our hope was always that the two pieces [the stage version and the installation] would travel together, and our audiences would experience both parts. I would say that the melodrama becomes a much more internalized and personal process within the installation. OR: [It’s] the immediacy [of the installation that makes that happen]—[the experience] becomes a lot more reflexive. OR: For the watcher and the performer, it becomes about a crash between your reflexive [body] and your social body and your animal body. You know where you are—you’re in your social body. But there’s something about [the piece] that really brings out your animal body. [There’s something about] being in that proximity with people and having to share that space. CC: You’ve talked about the installation as kind of a training for performers. 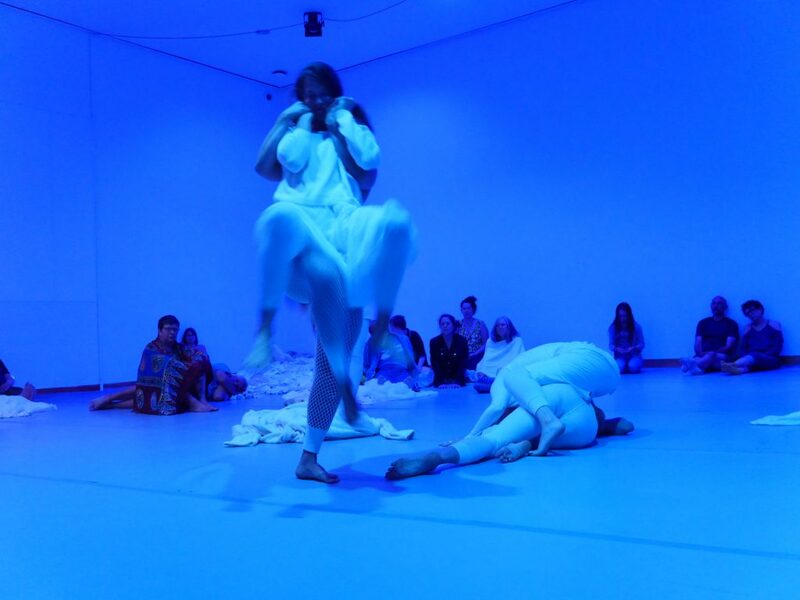 As you’ve both danced in the installation, what has the experience brought forth for you? OB: One of the things that comes up is the immediate feedback you get from people. You’re able to read people a bit more than you are when you’re in a big auditorium, for example. The immediacy of someone’s total fear, excitement, or joy takes over the installation. As a performer you have to practice this 360-degree performing, because it’s not at all frontal. But you also have to practice a super, uber full-on compassion practice for them [the audience member] and for yourself because you’re in this together. You’re creating the conditions for watching and [the conditions] for that person to be able to be present for you. If there is a feeling of discomfort or total awkwardness or if it seems like they aren’t interested—of course you have no idea if they’re [interested or] not—how do you keep going? OB: And you’re hyperventilating. And then they start to adjust their breathing. OR: If you’re just right there with someone, it’s not in your head. It’s in their body, and it’s in the space between your bodies. It’s a somatic experience of the audience. I think a somatic experience for the audience as well. CC: You used the word “awkwardness” earlier. How might it shape the way we think about empathy if we think about awkwardness or discomfort being the things from which empathy proceeds? OB: It’s a point of relation. Someone else is feeling awkward—not that I’m setting up someone else to feel awkward—maybe another way of saying this is that, in the practice of doing something difficult, there can be moments of awkwardness. I don’t feel like people need to be entertained or everyone needs to be beautiful in order for something to be successful. There are all sorts of phases of being human. OR: Awkwardness is interesting in empathetic contexts because you can think about empathy and it’s not necessarily about matching, about being the same. Sometimes [empathy] is [that] if someone’s happy, and then I’m happy, we’re sharing [happiness] together. But if there’s an awkward situation where someone [else is] not feeling good, it’s not as though you don’t feel good as well. If someone’s going to fall, you don’t try to fall as well. You try to catch them. The social practices are fairly broken in the installation in a certain regard because we [the performer and audience member are] there, together, without talking, and we’re just sharing space. The social practice is askew, so there’s going to be awkwardness. This happens in the theater also, but you are in the social construct of sitting in your seat. OB: And then there’s a possibility something new can emerge out of the awkwardness. OR: That’s not to say that there’s not a social construct that we’re in a gallery or we’re in an installation or we’re at the TBA festival. There are all those other social contracts. But the whole somatic experience of being close to people—it’s just going to shatter some of those [constructs]. And that’s what’s going to be awkward. Because the sensation that the audience has, that we have—just the intimacy is embarrassing sometimes in a way—just to really be with someone. OB: And the audience is really feeling what you [the performer] feels. When you feel yourself feeling, that can be really awkward and really painful for some people. CC: Susan Foster has written about some of the etymological roots of the idea of empathy, and how, many centuries ago, when someone said two people “had chemistry” people imagined electrons jumping off one body and onto the other—to “have chemistry,” to have magnetic empathy, was to always be engaged in an act of exchange. That brings up questions of power, because the exchange isn’t always equal. How do you feel the sensation of power within empathic exchanges when you’re performing in the installation? OB: In a way, the audience is invited in, but they’re of course free to leave any time they want. In some ways, they don’t know what’s going to happen when they’re in there. But we know. OR: We know. But we also don’t know. OB: We’re also improvising, and we don’t know who they are, so what comes up out of who they are is really [important]—the relationship between the two people is what really becomes the material. We’re in control of the installation to some extent. OR: But some people come in and take control. OB: Yes, they take over! OR: Some people come in and want to move. They take up the whole space. OB: They get so excited and take over. OB: So, in a way, the practice of empathy is the practice of giving up power or widening your perceptual field and lowering your tone, and then really trying to meet this other person. OR: I think empathic reflex—the layers of empathic reflex that we have—I think they’re kind of underlying control in a way. OR: I’m going to help you help yourself. OB: Yes, I’m going to help you help yourself. So it’s an interesting—if you are unpacking really complex mental issues, you don’t know who’s in control. OR: Audience members gets told, “Welcome to the installation. It’s going to be 15 minutes. You can go or stay. You can move anywhere you want, and I’ll come and get you when it’s over.” And that’s what they’re given. I think there’s a fair amount of agency in the audience. I guess “agency” is more of a term I would think of rather than control. OB: And that’s the language, [the language of “agency,” that] we use in describing the piece. OR: That’s what I’m looking for: agency. Not situations of control. CC: There are some controlling factors on the engagement that were your choices, but not choices you make in the moment of performance. How did you arrive at 15-minutes as the right length of time for each one-on-one engagement? OR: We did ten minutes before, but it was actually too short. OB: We’ve started working on a new piece called “The Empaths,” and we’ve been doing these one-on-one things that have come out of this installation. As part of the research for that we hit a twelve-minute minimum. Those experiments are traveling through public space, so they’re a little bit different. 15 minutes is plenty. That’s a really nice long chunk of time to do something. CC: It’s not the same person in the installation every 15 minutes, right? If someone comes more than once, they’ll, of course, have a different experience, but they’ll also potentially be with a new person? OB: Yes. There are four of us who will be rotating. So we’ll be doing hour to hour-and-a-half shifts each. One of the performers is actually a 15-year-old. CC: How do you prepare for your turn in the rotation? OB: I just warm up on my own and review the material. Because we’re improvising, there’s a whole bunch of material we’re working with. So I review that material for myself, and then I get myself in a really good space. I warm up. I get the fluids moving through my body. I do a lot of shaking. And I just kind of clear my space, so I can be present with people. OR: It’s really intense because it’s an hour straight. It’s really intense.